It was said that rather than worry about the beef, its main focus should be to develop milk production of this breed. They did this by working on the development of the udder, which was a cardinal virtue for cows of any dairy breed. 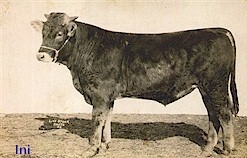 Many prize winning Brown Swiss bulls competed in St. Louis. The breed was said to be distinctly American; there were few imported entries at the Worlds Fair. Most of the cattle were furnished by men who had been breeding for many years without using much imported blood. The champion cow, Florine 12th, remainedin St. Louis for the 120 dairy test . This was a milk production test and cows of all dairy breeds were housed on the fairgrounds where they could be kept under similar controlled conditions. After the test, it was reported that Florine weighed 1,501 pounds. She had produced 5,924 pounds of milk during the 120 day test. Her milk contained 3.4% butterfat and 8.9% solids not fat. It was noted in the test results that Florine was sick and out of the test from September 30 - October 6. During that time she had given only 148 pounds of milk, so her record was credited with 265 pounds of milk based on previous and later production. Senior Champion Cow- Florine 12th 1569; sire, Eddie Bonapart; McLaury Bros.
Grand Champion Female- Florine 12th 1569; sire, Eddie Bonapart; McLaury Bros.
References: The Breeders Gazette (September 28, 1904); Dairy Cow Demonstration - A Record of all Breeds. Photos from Irwin Collection and Wisconsin Louisiana Purchase Exposition Report. This page was designed by Mike Friedrich and is maintained by Lyndon Irwin. Go back to the Dairy page. Go back to the Worlds Fair page.